"After a bad year with fruit, Alfredo Sánchez decided to give up on arable farming and raise livestock instead. So it was that, in 1999, he started a pig farm with 1,000 fattening pigs, and a year later expanded to 2,000 pigs. Over time, his son Oscar decided to become a farmer too, and took charge of a farm with 40,000 chickens. However, more attracted by swine than poultry, in 2013, Oscar decided to take control of the family farm, and the first thing he did was to transform the finishing farm into one for breeding, with 750 sows. - Why did you decide to change to another kind of farm? I got the chance to go and see a breeding farm by proposal of the agent that works with us, Ingafood, and which advised me on the process. When I saw the work they are doing, I loved it. They are totally different farms, with more complex operations, very complete facilities, and a lot of automated elements. And it is not the same to bring in pigs to fatten than to see them born at 1 kilo and work to grow them. - With the expansion of the farm, for confirmed gestation you opted for electronic feeding. Why? From the very first moment, I knew that would go for electronic feeding, since it is the only way to make sure that all sows eat their daily ration, and are well-fed when they start farrowing. Thanks to the chip, with a computer or PDA you can individually control the amount of feed that sows ingest, and see which have eaten and which not, and make the relevant corrections,... All of this helps you to keep the sows well-fed, avoid wastage of feed and, ultimately, control feeding costs. - Why did you decide upon the feeding machines distributed by Rotecna? We were advised on the best option. We also saw some farms where they had been installed and very good results had been achieved. So, after seeing what was on the market, the machine offered by Rotecna was the one that gave the best guarantees of working properly. Not only that, Rotecna is a strong company and a leader in the sector, with good customer care and technical assistance, so it seemed the best option. 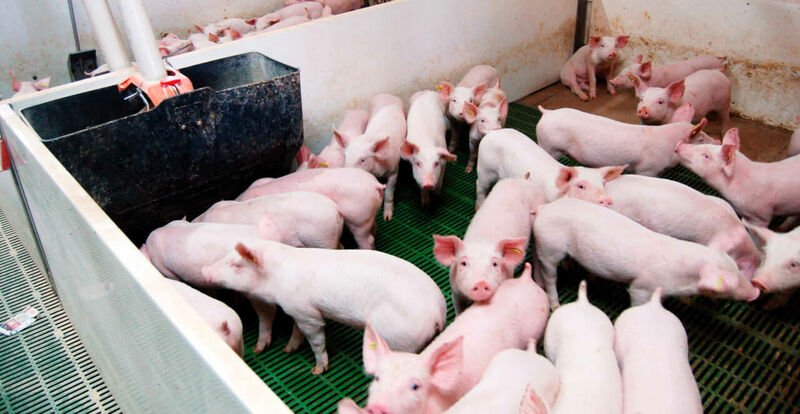 - How did the sows adapt to the machine? When replacement gilts enter for breeding, we leave them for two days to freely roam the quarantined area, to reduce fights. On the second day, we use a few boards to divide the barn in two, so the entrance to the machine is in one half and the exit is in the other. So, when a sow enters the machine and eats, they exit into the other side of the barn, which allows us to easily control the sows that might be having problems learning. With this system, in 7-8 days all the sows have learned to eat and we can remove the boards. - In farrowing, how do you organize the work to get the maximum performance out of the machines? We have five machines, one per barn, with dynamic herds of 70 sows. The first thing we do each day is look at the computer to see how many sows have not eaten, to rule out any malfunction. From here, we observe the sows that haven't eaten, and how long they haven't, and print their files with detailed information and the barn where they are located. Then, in the confirmed gestation barn, we locate the sows and work out what the problem is, which tends to be a limp or lost chip. - How many feeding curves do you work with? We work with 10 curves: replacement gilts; flushing, the first oestrus in gilts; nulliparous, first birth; standard 2 and 3, for the second and the third delivery; standard 4 and 5; and standard 6, 7 and 8. In addition, each curve has the option for thin and for fat pigs."